Under the new pricing program, contractors and installers can get Siemon’s high performance, US-made MAX 6 outlets at pricing levels that compete with low-cost, minimally compliant commodity connectors. Siemon, a leading global manufacturer of IT network cabling and infrastructure systems, offers new contractor pricing levels on its popular category 6 UTP MAX™ outlets. With this new pricing program, contractors and installers can get Siemon’s high performance, US-made MAX 6 outlets at pricing levels that compete with low-cost, minimally compliant commodity connectors. Unlike many minimally-compliant offshore connectors, Siemon’s US-made MAX 6 modules provide performance far exceeding category 6 connecting hardware performance specifications, delivering additional headroom and bandwidth to help ensure that the installed cabling plant performs as expected. 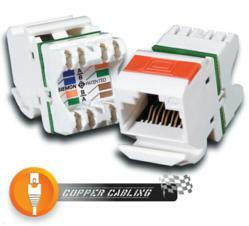 Cabling contractors also benefit from a number of installer-friendly features incorporated into the MAX 6 module. In addition to its fast, reliable and familiar punch-down termination process, the outlet’s S310™ termination blocks feature Siemon’ Pyramid™ wire entry system, which helps easily separate twisted pairs when lacing conductors, saving valuable time in the termination process. Available in angled, flat and keystone mounting styles and a wide assortment of colors, the MAX 6 outlet’s compact design is ideal for high-density applications. Up to six modules can be utilized in a single gang faceplate and twelve modules in double gang faceplate. The MAX jack’s low profile design is also ideal for space-challenged installations – its reduced mounting depth helps maintain proper cable bend radius in low-clearance work area environments such as in modular furniture. In addition to the new contractor pricing, Siemon also offers a new Value Pack option for angled and flat MAX 6 outlets. Consisting of 250 MAX 6 jacks, the Value Pack kits are designed to offer contractors additional cost savings on the most commonly used connectivity options. For more information on Siemon’s new contractor pricing levels for MAX 6 outlets and the MAX 6 Value Pack, contact your local Siemon representative or local Siemon authorized distributor. You may also visit http://www.siemon.com/mx6 for details. Established in 1903, Siemon is an industry leader specializing in the manufacture and innovation of high quality, high-performance network cabling solutions. Headquartered in Connecticut, USA, with global offices, manufacturing and service partners throughout the world, Siemon offers the most comprehensive suite of copper (unshielded and shielded twisted-pair) category 5e, category 6 (Class E), category 6A (Class EA) and category 7/7A (Class F/FA), and multimode and singlemode optical fiber cabling systems available. With over 400 patents specific to structured cabling, from patch cords to patch panels, Siemon Labs invests heavily in R&D and development of industry standards, underlining the company's long-term commitment to its customers and the industry.